Boy oh boy, that is one busy picture! Those look like reflections in the glass of the door to me. The first face near the top looks like it may be a black man in a white sleeveless tee. Right below HIS face it looks like a guy in a fedora with dark glasses on and a goatee, looks kind of like Heisenberg. Below THAT is the large face, which ALSO looks like it has a goatee and then at the bottom left of the door is the gray face. I can't tell WHAT that might be. I don't know where this store is, but if it's like the stores around here, they have all KINDS of ads and posters covering the windows. Many of them also sell DVDs and have posters for the movies everywhere in the windows. Is there a chance that these faces could be reflecting from postets, ads or signs that are hung up in the store windows? With the outlined pictures and looking at it closer here is my humble opinion to give this a logical explanation. The identity right behind the burglar could be the reflection/shadow of the burglar. 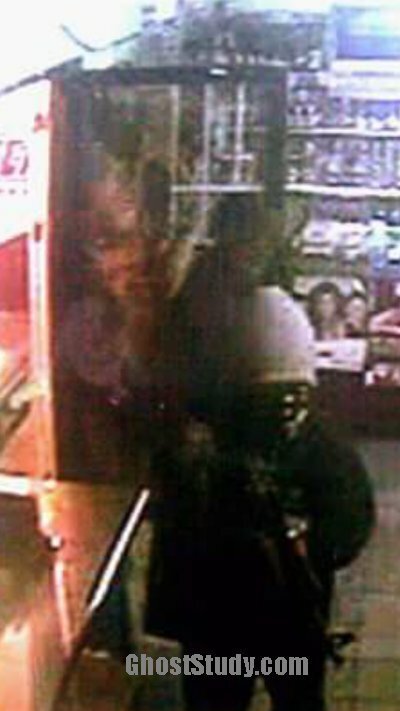 The identity in the top left corner could be the reflection of the owner of the store (see his head in front of picture). 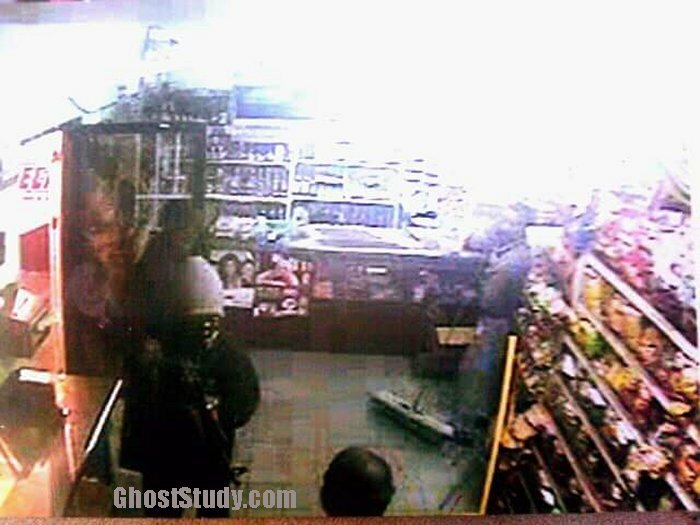 In my opinion the standing position of the burglar and the store owner corresponds to the reflection in the door. The big face (like king Tut) could be screen reflection from someone looking at a monitor (with a bad day I think). The other faces could be floating dust caused by the guy with the broom. Either way, it is a very cool picture with loads of content to discuss about. I have another option regarding the big face. It could be a reflection of a movie poster. I think it's the reflection of Will Smith (After Earth). This is a poster used in Latin America and this is a store in Mexico, so it could be an explanation. As for outlining, the others beat me to it. Thanks, guys. I have to go to bed. See ya later! I actually thought something similar. A lot of reflection and the "activity" seems to be primarily in the area of the glass door. The lighter "face", I think Frootloops outlined it on one of her pics, looks like a fingerprint. Lorac asked how they got the image and if they took a photo of the screen the image was on, it could be fingerprints. Someone touches the screen to show another person what they're looking at, leaves a print, no one notices it but when you take a photo of it the glare creates an anomaly. Just a thought. I don't know one way or another. Photo of a photo, you can see the edge of the photo at the bottom. Hi jim, sorry for the delay. I was able to get through to him and catch up a little bit. I will be moving to San Diego in a couple weeks and we plan to set up a date for a meet up! can't wait to see him!! The messages he sent me are in Spanish so I had to use Google translator to understand what he's saying. He said he has a lot more photographs of different supernatural things he has seen and a ton of stories he would like to share with me. When I see him he said he'll give me his collection. I can't wait to see what he's got. As for the original request (hahaha!) I will have tomorrow off of work so that'd give me enough time to translate and send everything he said over to you. Statement from Fabian's Dad.... I received it on August 16, 2017. 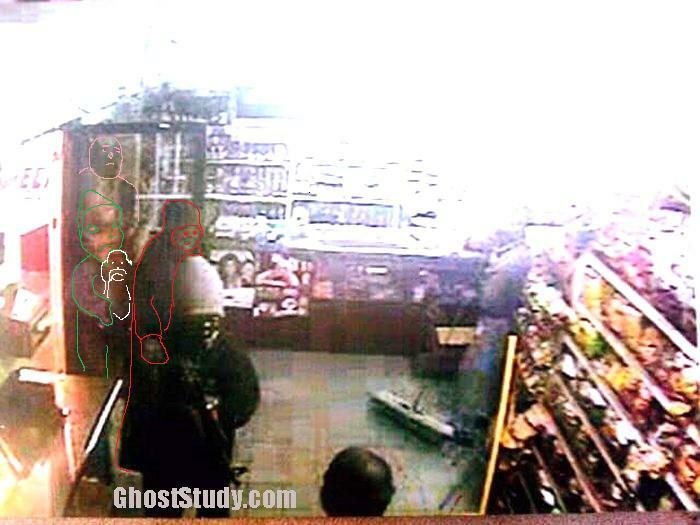 "THE HISTORY OF THAT PHOTOGRAPH IS THAT A YOUNG PERSON DRESSED IN BLACK CLOTHING WITH A BLACK HAT, BRINGS A LONG WEAPON (AN AK - 47 "HORN OF CHIVO") TO ASSAULT THE LITTLE STORE. THE ONLY PEOPLE THAT WERE THERE WERE THE OWNER AND HIS EMPLOYEE WHO CLEANED THE PLACE. THE GUNMAN TOLD THEM TO GIVE HIM THE MONEY OR HE WILL KILL THEM. HE GAVE HIM THE MONEY AND THE MAN RAN AWAY. WHEN I ARRIVED WITH MY PARTNER THE THIEF HAD ALREADY GONE. I SPOKE WITH THE OWNER AND THE EMPLOYEE AND BOTH WERE VERY SCARED. THE OWNER SAID THAT THE ASSAILANT HAD A PACT WITH THE DEVIL. I ASKED HIM WHY AND HE SAID HE WANTED TO SHOW ME THE VIDEO OF THE ROBBERY AND THAT HE WANTED ME TO TAKE THE PICTURE SINCE THEY DID NOT WANT IT. WHEN HE SHOWED THEM TO ME I SAW THE GUNMAN, WHO ENTERED ALONE, WITH A SKELTON DRESSED IN BLACK. ITS HAND IS SEEN ON THE MANS SHOULDER AND ON THE REFLECTION OF THE GLASS DOOR OF THE STORE I SAW A GIANT FACE OF THE DEVIL. AND BY THE DISPLAYS OF THE SWEETS AND CHIPS YOU CAN SEE FACES OF DEMONIC BEINGS IF YOU LOOK CLOSELY." Wow thats a thief with a grimm following! Its like the spookys are waiting for him! Yikes!!! In one of my outlines, I had the hand on his shoulder. Thanks for the update Jim and your outline interpretation MacC It looks a scary situation! Brr, can't help it to say, but this picture is just freaky. I don't think it's all reflection we see here. I have no explanation for why it is'nt a reflection. But just my feelings about this picture. I'dont like looking at this picture. The story about this picture is interesting. I wish the actual surveillance video still existed. That would be interesting.